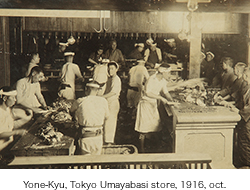 With the abolition of the Sakoku policy(the self-isolation policy of the Tokugawa shogunate), when Japan was stepping into modern era, the demand for meat suddenly increased, mainly among the newly dwelling foreigners of Yokohama. Hearing that, TAKENAKA Kyuji, a wholesale dealer of rice in Ryuo town Shiga(a prefecture next to Kyoto), thought of taking part in this new business. Kyuji knowing much of the world and having a matchless frontier spirit, and his younger brother MORISHIMA Tomezo(adopted by the Morishimas) supporting him, became the origin of MORISHIMA. At a time when means of transportation were limited, Kyuji walks through an unbelievable land trip of about two weeks, leading cows to Tokyo. 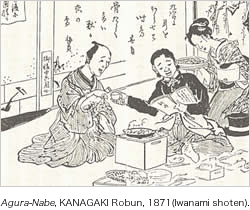 And, in the year 12 of Meiji(1879), opens an early Gyu-Nabe(=beef-pan: beef served with the pan in which it was/is being cooked) restaurant "Yone-Kyu" in Asakusa. a Japanese modern poet TAKAMURA Koutarou sang of the flourish of Yone-Kyu in his Dinner at Yone-Kyu(1922), which lets us suppose how popular it was back then. 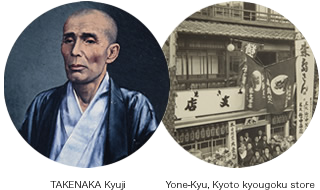 Though Yone-Kyu knew its glorious vogue around the Meiji and the Taisho era, the Takenakas and the Morishimas had to leave the administration of the restaurant, because of the impact of the Great Kanto Earthquake and of the planned economy during World War II. Since then, the Morishimas continued their effort in the evolution of the fattening art and in the promotion of the Oumi beef, based on the fertile plain of Gamouno in the east of the lake Biwa. And in 1978, they started the MORISHIMA corporation that covers from fattening, butchering to serving in their own restaurant. This particular spelling has its meaning; 毛(Mo):hair, 利(Ri):profit, 志(Shi):resolution, 満(Ma):to satisfy; so it states the resolution to satisfy all the customers taking only a hair of profit. Loyalty first and profit aside ; which is exactly the philosophy of the merchants of Oumi : 先義後利(Sen-Gui, Ko-Ri). Holding a name reflecting this philosophy, we are open here at Omi-Hachiman, every day except Wednesdays, taking daily this principle of commerce to heart. The basin of the three Echi Hino and Yasu rivers that flow from the Suzuka mountain range to the lake Biwa, is originally blessed with clear water and owes a rich grain production to double-cropping. 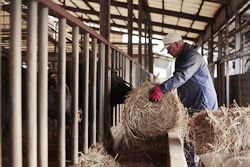 Which are, with the basinal climate, the most suitable condition for fattening cattle. Keeping our own farm in this basin, we purchase only the reputed black-haired japanese cows(＝Wagyu) coming from the ancestry of Tajima region. And giving them pure groundwater everyday, never failing in affection, we lead them a healthy and stressless life for more than 2 years that makes them a matchless and unique Oumi beef. To treat our guests with the very ingredient of Oumi beef put as the basis of all the dishes, that is to be always aware of our being given lives from this irreplaceable ingredient we inherited, and to serve it in the most simple and natural form. And the Oumi beef shines more brilliantly, cooperating with other ingredients of the seasons. We recommend you the good old and unchanged Suki-yaki, Shabu-shabu, and especially our specialty since our opening; Ishi-yaki. Ishi-yaki(=stone-grill) is the most popular of our dishes, thick steaks(fillet and sirloin) you grill yourself on a large heated stone plate, specially cut from a volcanic rock of the Mt. Fuji. Tables not requiring reservations, small rooms modestly decorated with flower arrangements, a banquet hall accomodating up to 100 guests, and the grill department(＝Teppan-Yaki), where our chef will show you his skills, with a Japanese lacquered wall painted with beautiful traditional patterns for a background. We will serve you, never failing in the spirit of Omotenashi(=hospitality), complying with diverse wishes. 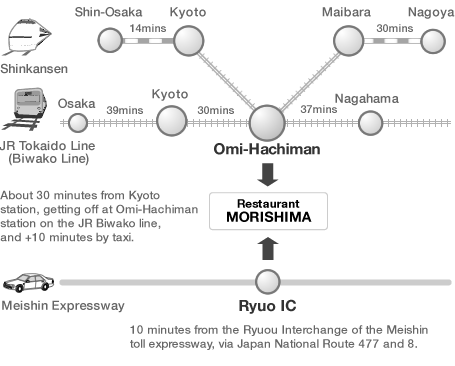 Access by car :10 minutes from the Ryuou Interchange of the Meishin toll expressway, via Japan National Route 477 and 8. Access via railway :About 30 minutes from Kyoto station, getting off at Omi-Hachiman station on the JR Biwako line, and +10 minutes by taxi. (Last order : weekdays ～20:30 / Sundays and national holidays ～20:00.